Andddd we're back! With more nail vinyl nail art thanks to Glam My Mani. I reviewed the first half of swirls and such last week - here. 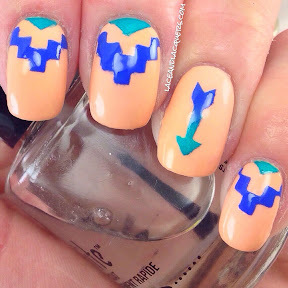 This week I have Aztec designs, Mini Chevrons, and Arrows - oh my! Check out what I did with 'em out down below. Part of the Aztec designs, I used the triangles strip to create a funky french mani with Polish & Co The Opposite of White and a base of Color Club Barely There. Added a little somethin extra by dotting Sally Hansen Liquid Gold at the base of my nail. 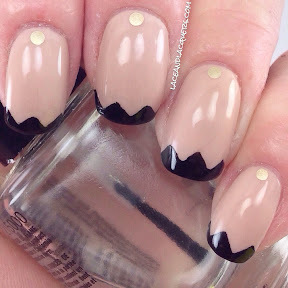 Last but not least, I created this mani using the Mini Chevrons nail vinyls. I used a base of Orly Harmonious Mess and then layered The Hungry Asian Dream Car for the sparkly chevrons. Soft but sparkly! These are the only vinyls I had an issue with. I think because they're so thin, they had a hard time sticking to my nail. Not sure, but they didn't want to cooperate haha. These were a lot of fun! I really, really enjoyed the Aztec designs sheet. I love how it came with 4 different designs to use. 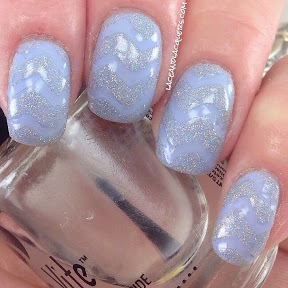 Again, if you want to see the Swirl, Wavy Line and Heart vinyls, check out my last post - here.